Almost unnoticed, the Austrian member of parliament Peter Pilz recently disclosed new information about operation Eikonal, under which NSA and BND cooperated in tapping some fiber-optic cables at a switching center of Deutsche Telekom in Frankfurt, Germany. As part of the NSA umbrella program RAMPART-A, Eikonal was set up to gather intelligence about targets from Russia, the Middle East and North-Africa. Because the cables that were tapped came also from countries like Austria, Switzerland, France, Belgium and the Netherlands, there were fears that their communications were intercepted too. Here, the newly disclosed information will be discussed and combined with things we learned from the hearings of the German parliamentary commission that investigates NSA spying, including operation Eikonal. The new information comes from transcripts of some fax and e-mail messages from employees of BND, Deutsche Telekom and the federal Chancellery, which Peter Pilz published on his website on October 23, 2015. He never told how he got these highly sensitive documents, but as they were made available to the parliamentary inquiry commission, it seems most likely someone from or very close to this commission must have leaked them to Pilz. Strangely enough, this leak was never investigated. Also remarkable is that the information and documents disclosed by Peter Pilz were almost completely ignored by mainstream German media like ARD and ZDF and the major newspapers. The latest disclosure was for example only reported by the Austrian paper Der Standard and the German tech website Heise.de. By contrast, in neighbouring countries like Austria, Belgium and the Netherlands, the Pilz revelations were big news and led to official investigations. Through May and June of this year, he had published lists of communication links related to Switzerland, France, Luxembourg and Poland too, claiming they showed to what extent BND and NSA spied upon these countries. Initially, Peter Pilz claimed these links were from a priority list of the NSA, but neither he, nor the commission hearings could clearly confirm this. The Dutch website De Correspondent reported that there was even a much larger list of some 1000 transit links, of which ca. 250 were marked in yellow. Now, Pilz confirms that there's indeed such a large list: it was prepared by Deutsche Telekom and contains all its 1028 transit links. Employees of BND had marked 256 of them in yellow, apparently the ones they were most interested in, and hence the list became known as the BND priority list. He doesn't mention an involvement of NSA at this stage anymore. Now that we know the large list of over 1000 links isn't an even larger "wish list", but a list of all available transit links, it could well be that BND tried to select around 20% of them, as a rather strange provision in German law says that bulk collection is only allowed up to a maximum of 20% of a cable's capacity. As Telekom Austria rented the channels to Vienna, we can assume that other national telecommunication providers also rented their links to Frankfurt, with Deutsche Telekom being the owner of the cables as part of their international backbone network. wie heute morgen besprochen übersende ich Ihnen die Liste der Transit-Leitungen der DTAG. Wir bitten Sie die gelb unterlegten Verbindungen bzgl. ihrer Führung (z.B. Ffm 21 oder Norden-Nordeich) und ob in der 2-Mb-Ebene greifbar, zu analysieren. In this mail it is asked to analyse whether the transit channels marked in yellow can be intercepted at the 2 Mbit-level, either at Deutsche Telekom's Frankfurt am Main Point-of-Presence 21 (Ffm 21) or at Norden-Norddeich. The latter is a town at the northern coast of Germany, where the SeaMeWe-3 and TAT-14 submarine cables land. For the parliamentary commission this was a reason to ask whether also cables where intercepted over there, but that was strongly denied by the witnesses involved. Interestingly, the phrase "ob in der 2-Mb-Ebene greifbar" suggests that it could be possible to just intercept specific 2 Mbit/s channels while leaving the other ones untouched (one physical STM1-cable has a data rate of 155 Mbit/s and contains 63 virtual channels). A. 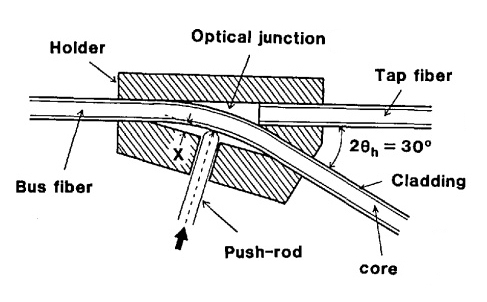 When the physical fiber is intercepted before it reaches the switch, it has to be bend in order to catch the light that leaks. Because this leaking signal is much weaker, it has to be amplified before it can be processed. In this way it's not possible to select individual channels: the eavesdropper gets everything that runs over the fiber, and has to demultiplex the channels himself to select the ones that contain traffic of interest. B. When the interception takes place at an optical switch itself, then it's possible to only grab the virtual channels you are interested in. 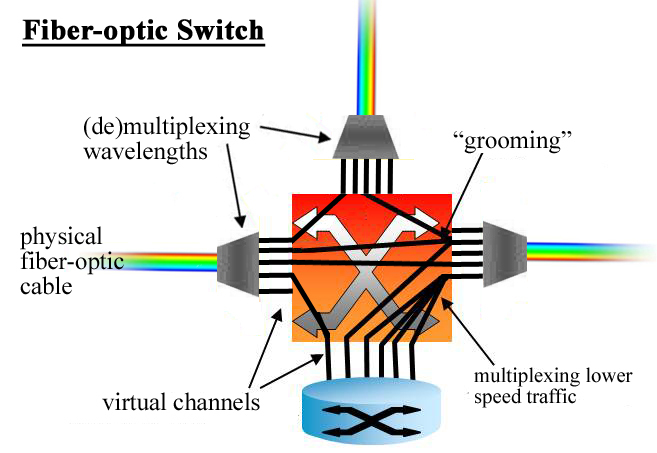 A physical cable contains channels which have to be demultiplexed at the switch in order to be forwarded (switched) to the fiber that leads to the intended destination. When the switch converts the optical signals into electronic signals it is even more easy to duplicate only individual channels of interest. During the commission hearing of March 26, 2015, Klaus Landefeld, board member of the DE-CIX internet exchange, indicated that at least since 2009, interception takes place at the switch. Also, the so-called G10-orders authorise interception based upon Autonomous System Numbers (ASN) which are used for logical paths, rather than by naming physical cables to or from a certain city. However, it seems that under operation Eikonal, the fiber-optic cables were tapped by splitting the cable signal before it reached the switch. This was more or less clearly indicated by several witnesses heard by the parliamentary commission, and there are several other indications too. In 2004, it was apparently not yet possible to establish a tap at the switch itself to get access to individual channels (although Deutsche Telekom could have demultiplexed the fiber and only forward the channels of interest to BND, but this wasn't the case). das Bundeskanzleramt ist sehr interessiert, dass der Bundesnachrichtendienst im Rahmen seines gesetzlichen Auftrages kabelgestützte Transitverkehre aufklärt. Der vom Bundesnachrichtendienst in Ihrem Unternehmen geplante Aufklärungsansatz steht aus hiesiger Sicht in Einklang mit geltendem Recht. Ich darf auf diesem Weg die Anregung des Bundesnachrichtendienstes weitergeben, in der Deutschen Telekom AG, T-Com, den Bereich RA 43 (Staatliche Sonderauflagen), zu dem bereits im Rahmen der Strategischen Fernmeldekontrolle Kontakte bestehen, mit der Durchführung der auf Seiten der Deutschen Telekom AG erforderlichen Maßnahmen zu beauftragen. It says that in the opinion of the Chancellery, the proposed BND operation is according to German law. The Chancellery encourages Deutsche Telekom to instruct its lawful intercept unit RA 43 (which is one of four Regionalstellen für staatliche Sonderauflagen or ReSA) to start taking the necessary measures for the interception. gerne bestätigen wir Ihnen den Erhalt Ihres Schreibens vom 30. Dezember des letzten Jahres. Die T-Com ist sich der Bedeutung eines gut funktionierenden Nachrichtendienstes für das Gemeinwesen der Bundesrepublik Deutschland - insbesondere vor dem Hintergrund der terroristischen Angriffe des 11. September 2001 - bewusst und wird daher die geplanten Aktivitäten des Bundesnachrichtendienstes, die kabelgestützten Transitverkehre im Rahmen seines gesetzlichen Auftrages aufzuklären, unterstützen. Then on March 1, 2004, the BND and Deutsche Telekom signed the so-called Transit Agreement (pdf), in which the latter agreed to provide access to its transit cables, and in return will be paid 6.500,- euro a month for the expenses. This agreement was also leaked to Peter Pilz, who published it on May 18, 2015 in the Austrian tabloid paper Kronen Zeitung. Der Geschäftsbesorgungsvertrag "Transit" ist ja jetzt von beiden Seiten unterzeichnet und gestern habe ich die beiden ersten Monatszahlungen veranlasst. Daher erdreiste ich mich, Sie um die erste Schaltung von Leitungen zu bitten. Realising the access was apparently not that easy, because it took until December 2004 before the first cable was connected. Then it appeared that it's signal was too weak, so in January 2005 an amplifier was installed - as the parliamentary commission was told by S.L., who was the BND project manager for Eikonal (note that the use of an amplifier indicates tapping the entire fiber-optic cable). At this first stage of operation Eikonal, only circuit-switched (Leitungsvermittelte) telephone communications were intercepted. Collection of packet-switched (Paketvermittelte) internet communications started in 2006 (see below). Habe heute früh die o.g. Verbindung auf die Punkte 71/00/002/03 19 + 39 zugeschaltet. In der Anlage ist die Belegung lt. RUBIN ersichtlich. Auf den Kanälen 2, 6, 14, 50 befinden sich die in der Liste markierten DSVn mit der Endstelle Luxembourg. Bitte um Rückmeldung ob das ganze funktioniert. We also see the term RUBIN (German for ruby), and during the commission hearings it seemed that this was an alternate codename for operation Eikonal. But when heard on January 15, 2015, Harald Helfrich explained that RUBIN is actually a system that Deutsche Telekom uses to manage its communication links and cables - which perfectly fits how the term is used in this e-mail. According to Peter Pilz, additional cables were connected on February 14 and 25, as well as on March 3, 2005. Unfortunately, he either doesn't possess or didn't disclose the related e-mails, so we still don't know how many and which channels have actually been intercepted. The interception of telephony communications therefore started in the Spring of 2005, which means that collection under Eikonal only lasted for 3 years, and not 4 years, when one would count from signing the agreement in 2004 until the end of the operation in 2008. Wie wir bereits telefonisch besprochen, teile ich Ihnen mit, dass die Verarbeitung von reinen leitungsvermittelten "Transit-Verkehren" von uns nicht mehr durchgeführt wird. Aus diesem Grund kann die Ableitung der Transit-Verkehre in unseren Betriebsräumen eingestellt werden. After that, Thorwald writes that there's currently a need to extract the traffic of two STM-64 and four STM-16 cables, which have a data rate of ca. 10 Gbit/s and 2,5 Gbit/s respectively. This is also said to be circuit-switched, but "extraction at a higher level". If we assume that Peter Pilz provided the correct date for this e-mail, it's strange that there was apparently a need for new cable accesses, hardly a month before operation Eikonal was officially terminated (June 2008). Even more strange is that the e-mail says the new accesses are also circuit-switched (leitungsvermittelt), while during the hearings it was testified that the collection of such telephone communications ended in January 2007, after Deutsche Telekom fased-out its business model for dedicated transit cables. This e-mail brings that message almost 1,5 years later! From the commission hearings we also learned that BND wanted access to internet traffic too, which is packet-switched (Paketvermittelt). For this, the first cable became available by the end of 2005, but it took some months before the backlink was also connected. In the spring of 2006 a second cable was added, and the front-end system and the filters were tested until mid-2007. Could it be that mr. Thorwald just made a mistake, and wrote "leitungsvermittelten" where he meant "paketvermittelten"? But even then, why add new internet cables, just before the operation was ended? A similar anomaly can be found in an e-mail, that according to Peter Pilz, was sent one day later, on May 28, 2008. 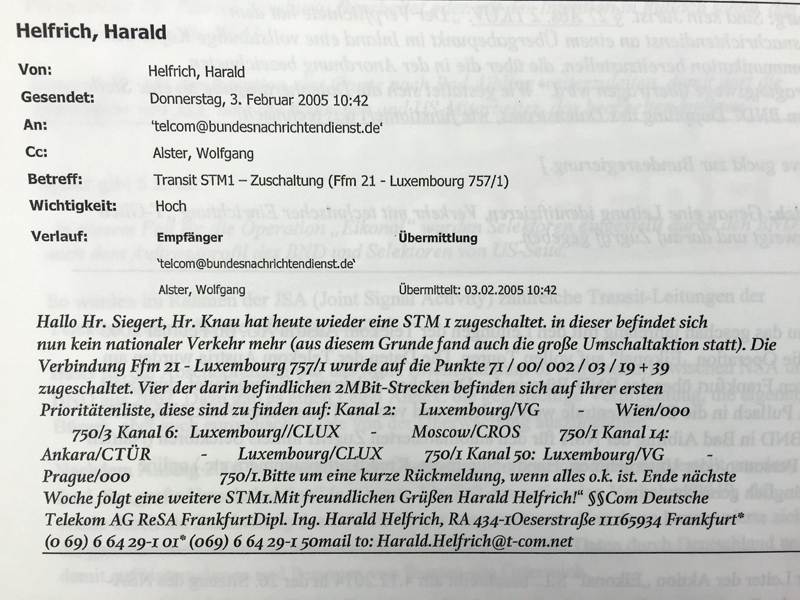 In it, mr. Knau informed Harald Helfrich and his superior Wolfgang Alster that the access to four STM1-cables can be terminated immediately. Given what was said during the commission hearings, one would have expected that this also had happened already in January 2007, instead of May 2008. It seems some things don't add up here. Unlike the numerous virtual channels in the lists, this e-mail is about physical cables. 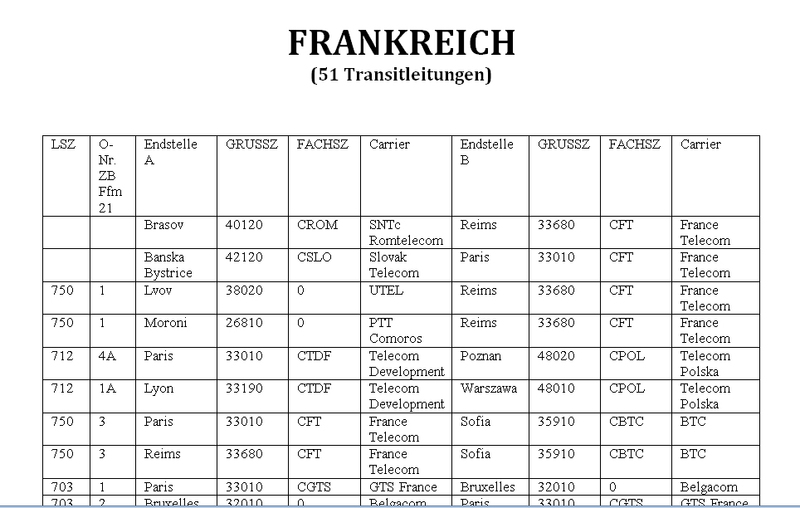 "Ffm 21 - Luxembourg 757/1" is the one mentioned in the e-mail from February 3, 2005, containing 4 channels of interest to Luxembourg; the others are cables from Frankfurt (Ffm) to Reims, Paris, and Deutsche Telekom's Point-of-Presence in Stuttgart. With this, we now have proof of 3 other cables having been tapped. 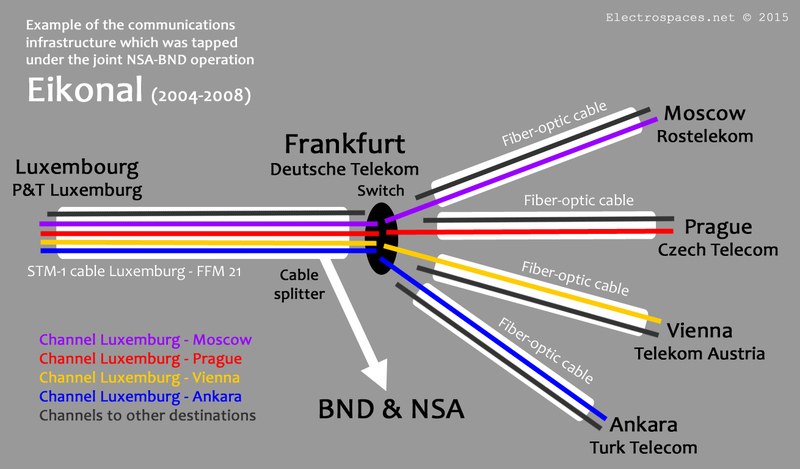 Operation Eikonal did start something else though: it provided BND with the knowledge and the experience for conducting cable tapping on its own: in 2009 they started intercepting cables from 25 internet service providers, this time at the DE-CIX internet exchange in Frankfurt - as was revealed by Der Spiegel on October 6, 2013. Among these 25 providers are foreign companies from Russia, Central Asia, the Middle East and North Africa, but also 6 German providers: 1&1, Freenet, Strato AG, QSC, Lambdanet and Plusserver, who almost exclusively handle domestic traffic. It appears that this interception takes place in cooperation with the DE-CIX Management and that the various providers themselves didn't knew that this was happening. A smart move, as this provides BND with just one single point-of-contact, while the indivual providers can honestly deny that their cables are being intercepted. Since last Spring, the German parliamentary commission investigating NSA spying is trying to find out whether the Americans secretly tried to spy on German and European targets. During the hearings it became clear that the German foreign intelligence service BND wasn't able to fully prevent that selectors, like e-mail addresses and phone numbers, provided by the NSA, were fed into the collection system. A special investigator was allowed access to the lists of rejected selectors and he reported about his findings last week. Here follows the background of this affair and the most important and interesting details from the investigation report. The origins of the selector affair go back to 2004, when the Americans turned their satellite intercept station Bad Aibling over to German intelligence. In return, BND had to share the results from its satellite collection with the NSA, for which the latter provided selectors, like e-mail addresses, phone numbers, etc. of the targets they were interested in. Besides the satellite interception, Bad Aibling was also involved in cable tapping, but only under operation Eikonal (2004-2008), which was limited to cables from Deutsche Telekom in Frankfurt. Until 2013, NSA is said to have provided some 690.000 phone numbers and 7,8 million internet identifiers. As a foreign intelligence service, BND is not allowed to collect German communications, let alone hand them over to NSA. 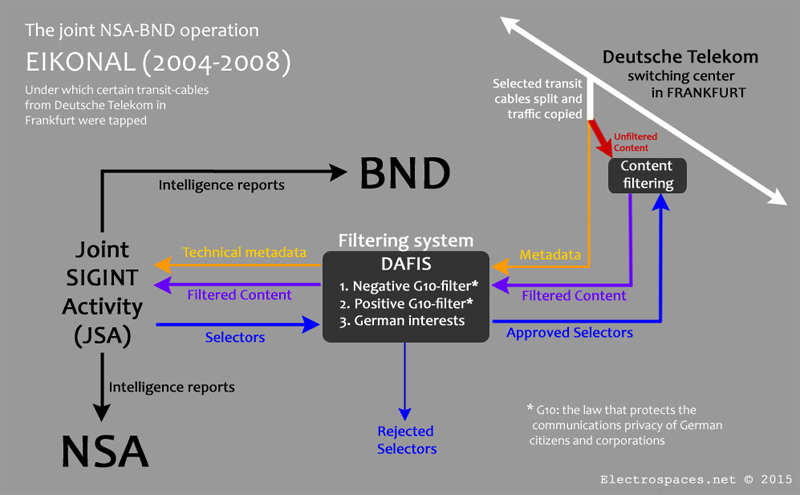 In order to prevent that, BND tried to check all these selectors, initially by hand, but since 2008 by using a automated filter system called DAFIS. 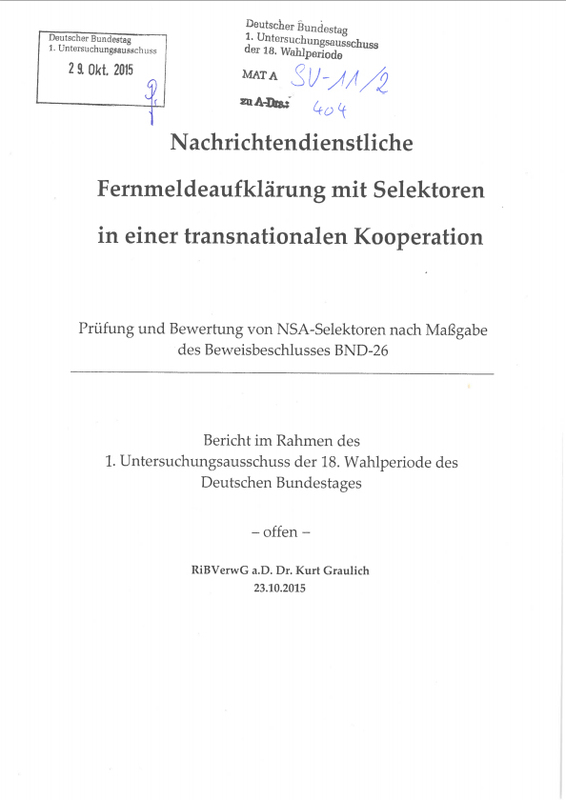 During a number of tough and lengthy hearings of the parliamentary commission that investigates NSA spying, BND employees had to admit that DAFIS was only able to defeat selectors that were clearly recognizable as belonging to Germans, like mail addresses ending with .de or phone numbers starting with (00)49. There was hardly any effort to sort out selectors related to other European countries. Also the foreign e-mail addresses, like from Hotmail or Google, used by Germans were only blocked when someone at BND stumbled upon them. Although these kind of selectors could have been blocked more systematically, it's impossible to enter all relevant ones into the DAFIS filter. This means, when NSA targeted such foreign addresses, the chances they were rejected by DAFIS are not very high and will therefore have been activated on the collection system. Such selectors went into the tasking database, without practicable or reliable means to identify and block them. When the DAFIS system found recognizable German selectors, they were marked as disapproved and not entered into the collection system, so they could not lead to any results. Initially it seemed that these rejected selectors were put into a separate repository (German: Ablehnungsdatei, also Ausschussliste), but actually they stayed in the tasking databases and were only extracted for the purpose of the parliamentary inquiry. This resulted in a list of almost 40.000 rejected selectors. An investigation by BND employee Dr. T. in August 2013, revealed almost 2000 e-mail selectors that had been activated, but now seemed politically sensitive. A simultaneous investigation by W.O. resulted in over 10.000 e-mail selectors belonging to European government agencies. Members of the parliamentary investigation commission were eager to see those selectors, but they are sensitive and classified, so the government denied them access. Finally, a compromise was made, under which an independent special investigator was allowed to examine the lists of rejected and suspicious selectors and report back to the commission, without disclosing individual targets. a. The Ablehnungsliste, containing 39.082 selectors (2.918 from the telephony and 36.164 from the internet tasking database) from 2005 till March 2015.
b. The 2000er-Liste, containing 1.826 e-mail selectors, which were found in August 2013 by Dr. T. and subsequently marked as disapproved. c. The 2005er-Liste, containing 74 telephone selectors (52 belonging to EADS, 22 to Eurocopter), which were found by the end of 2005 and were marked as disapproved in January 2006.
d. The Nachfund 1, containing several lists with a total of 444 telephone selectors that were found by semi-manual checks in 2007 and were all marked as disapproved. e. Not available anymore were between 10.000 and 12.000 e-mail selectors that were found by BND employee W.O. when he checked the tasking database for terms related to European government agencies. He found results for 18 EU member countries and these selectors were marked as disapproved. - SCREENNAMES: User names or numbers, mainly used for VoIP calls. - OTHER: For example user names, messenger or social network identifiers, cookies, login-data, phone numbers, hashes, etc. In the tables that contain telephone selectors there's also a field for a description, like a text explaining the reason for targeting, a code or an abbreviation like CT for Counter-Terrorism. For internet selectors, these descriptions were only visible for NSA personnel, but due to technical reasons not for BND and are therefore not available anymore. 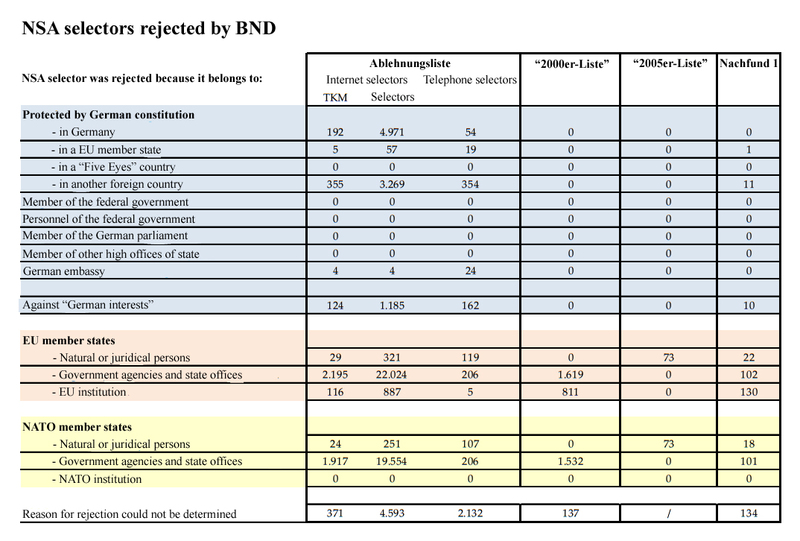 Because they lacked justifications, BND stopped using NSA provided internet selectors for the time being as of May 2015. Keywords were also used as selectors, but according to the report, they are rarely used, because they have to be very specific. Generic words like "bomb" would produce way too many irrelevant results. It's not clear whether PSTN only applies to traditional land line phone numbers, or also includes mobile phone numbers (known as MSISDN). Together with experts from BND, special investigator Graulich examined all the selectors on these lists and tried to determine the reason for which they were originally rejected. Most important is the Ablehnungsliste, with the selectors that had been filtered out by the DAFIS system. Most of the telephone selectors appeared to have been rejected because they belonged to German persons or companies and/or contained .de or (00)49. The e-mail addresses for VoIP calls were all blocked because they had no top-level domain - selectors that could not be attributed to a country were rejected. On the website Netzpolitik.org it was noticed that for VoIP, one doesn't use e-mail addresses, but SIP addresses, which do have a similar format, like 3246697@voipprovider.com, but which are often under generic top-level domains. Also, blocking IMEI addresses containing "49" wouldn't be very effective, as there are other codes used for Germany, and phones may be sold throughout the European Union. Some telephone selectors were also not activated because the description field contained terms like for example "German", "Germany" and "Europe". For one internet identifier, like for example an e-mail address, there are multiple permutations, each of which is counted as a separate selector. There can be up to 20 different permutations for one identifier, which explains the very high total number of internet selectors (7,8 million), compared to those for telephony (690.000). Taken together, all permutations of an internet address are called a Telecommunications Identifier (German: TeleKommunikationsMerkmal or TKM). For telephony, the TKM equals the selector, in other words, there are no permutations for phone numbers. Many internet selectors were rejected by the DAFIS filter system because they belonged to German persons or companies, contained German codes like .de and (00)49, or names of German companies. Also a number of IP addresses had been rejected, but it wasn't possible to determine why. They now belong to providers outside Europe. The investigator could also not determine what the reasons had been for blocking the remaining internet identifiers, like user names, messenger or social network identifiers, cookies and login-data. NSA provided them combined with other selectors in a so-called equation, but BND separated these for DAFIS filtering, which makes it impossible now to relate them to identifiable selector types. Of the Telecommunications Identifiers (TKMs) found in the main Ablehnungsliste with the rejected selectors, 62% belong to government agencies of EU member states, 19% to Germans outside Europe, 7% to EU institutions, 6% to Germans, 4 to foreigners abroad, 1% to Germans in Europe and 1% to German embassies. 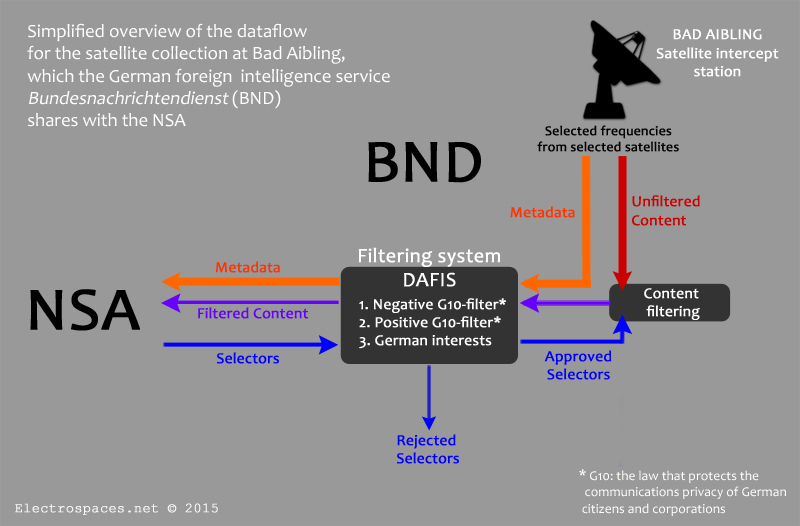 The examination of the selector lists revealed that NSA provided several hundred selectors related to Germans, but most of them were blocked by the DAFIS filter. Around 250 had been active for a shorter or longer period of time, but it is not known whether this resulted in communications being collected. As the 2002 Memorandum of Agreement (MoA), under which the cooperation at Bad Aibling was established, prohibits targeting Germans, the German selectors that had been activated are a violation of the agreement, and moreover also a violation of German law. The rejected selectors are mainly about German companies, both inside Germany and outside Europe. Without knowing the reasons for targeting these companies, it cannot be said whether this would constitute economical espionage. Construction companies for example can be involved in both civilian and military projects (so-called dual-use). It is interesting to see that there are no rejected selectors that belong to German cabinet ministers. This means, NSA wasn't so stupid to send BND the list of selectors that contains the phone numbers of chancellor Merkel, several ministers and high-level federal government officials - a list that was published by WikiLeaks last July. Even more interesting would be to know whether the rejected selectors contain the phone numbers of the French prime minister and his cabinet ministers, which were on a similar tasking database list that was published by Wikileaks in June. Special investigator Graulich wasn't able to determine this, because Wikileaks redacted the last four digits of the phone numbers. The biggest number of rejected selectors are e-mail addresses (and some other internet identifiers) of European government agencies: 22.024 selectors, being the permutations of 2195 telecommunication identifiers (TKMs). The overwhelming majority of them was only blocked after August 2013, when the public outrage over NSA spying began. First, selectors were disapproved after the investigations by Dr. T. and W.O., and in November, BND president Schindler ordered all e-mail addresses with a European Top-Level Domain (TLD) to be removed from the BND and NSA tasking database. - Stage 3 blocked an initially small number of foreign identifiers that should not be activated because that would be against "German interests". This means that until the end of 2013, the e-mail addresses belonging to European governments had been active in the collection system: 12% of them for up to 100 days and 87% for an even longer period of time. Foreigners and especially foreign government agencies, have no right to privacy under the German constitution, so the collection of their communications is not a violation of German law. But investigator Graulich does consider the targeting of European governments a violation of the Memorandum of Agreement, which allows collection against European targets only for a very few specific topics. Although the reasons why NSA was interested in these subjects are not known, the investigator judges that the broad targeting of European governments (like e-mail addresses of all members of government staff bureaus) is far beyond what the memorandum allows, and therefore this constitutes a severe violation of the agreement. 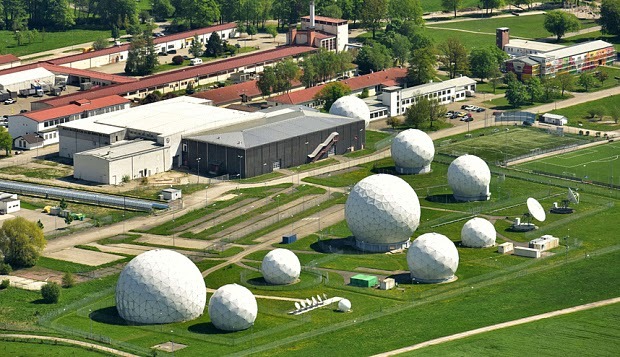 Graulich also says that NSA apparently misused the Bad Aibling satellite station to spy on other European countries - risking an embarrassment for Germany in its relationship with EU and NATO partners. However, BND itself also targeted for example the British embassy in India and the French embassy in Mali, and eavesdropped on the US Defense and Foreign secretaries as well as senators, when they used non-secure phone lines while traveling. When in November 2013, BND searched through its own tasking database (PersonenBezogene DatenBestände, or PBDB), it came out that it too contained some 2800 selectors belonging to friendly nations. They were subsequently deleted, but this was kept quiet for almost 2 years. On November 11, 2015, it was reported that a preliminary report by the investigation team of the parliamentary intelligence oversight committee says that among BND's own selectors, there were ones belonging to the FBI, the Voice of America, French foreign minister Fabius and the interior departments of EU member states like Poland, Austria, Denmark and Croatia. Also targeted were international organizations like the ICC, the WHO and UNICEF. The selectors also included e-mail addresses, phone and fax numbers of the diplomatic representations of the US, France, Great Britain, Sweden, Portugal, Greece, Spain, Italy, Austria, and Switzerland, as well as European and US companies like for example Lockheed. On November 26, 2015, Albert Karl, an official from the federal Chancellery, testified that European governments are not among the official goals which the government set for BND's intelligence mission (German: AufgabenProfil der Bundesregierung or APB). It's of course possible that European citizens are targeted because they are involved in terrorism or weapon proliferation. On December 16, 2015, German media reported that at least 3 BND-employees, including SIGINT-director Hartmut Pauland, will have to resign. This after the regular parliamentary intelligence oversight committee found that BND had some 3300 targets, including EU institutions and governments, that were not according to the goals set by the government and therefore illegal. In the future, politically sensitive selectors will have to be approved by the BND leadership. One last thing that should be mentioned is that at Bad Aibling, the collection effort is directed at (the downlinks of) satellite links from crisis regions like the Middle East, Afghanistan and Africa. This means, that if NSA deliberately provided BND all those selectors of European government officials, they should have known that they couldn't result in their day-to-day business communications. Using these selectors to filter traffic from the satellite links from the crisis regions, would only provide content when those European officials communicate with their counterparts or other people over there. And maybe it was just that what NSA wanted to find out - an option that was not considered in the Graulich report though. In a first reaction on the report, the German government said that there will be stricter guidelines for the cooperation between BND and NSA, and also that oversight by the federal Chancellery will be increased. Opposition party members of the commission aren't fully satisfied with the report and still want access to the rejected selectors, as well as an examination of all 8 million selectors that NSA provided to BND. On Thursday, November 5, special investigator Dr. Kurt Graulich was heard by the parliamentary investigation commission about his findings. This hearing didn't provide any significant new insights. The other witness that day, BND lawyer Dr. Werner Ader, revealed that at Bad Aibling, there's highly sophisticated equipment, which allows the interception of satellites even under difficult circumstances, like coping with atmospheric disturbances and following non-geostationary satellites. The equipment "can follow what happens at the satellite". In the German magazine Der Spiegel from April 2, 2016, it was explained on page 33 that selectors used by BND have the following format: they start with an e-mail address, a phone number or a similar designator, followed by the intelligence topic, with WPR for Waffenproduktion, LAP for Landwirtschaftspolitik, TEF for Terrorfinanzierung and ISG for Islamistische Gefährder, then the country which is spied upon, designated by 3 letters, and finally a Sperrvermerk for those foreign intelligence agencies that should not see the results for this selector. They are designated with a 4-letter abbreviation of their codename, like HORT for HORTENSIE (United States) or BEGO for BEGONIE (Denmark).